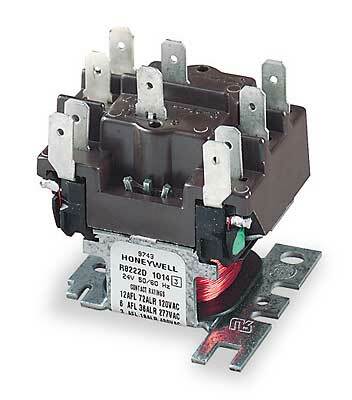 24 Volt Blower Control Switching Relay is used in many different Furnaces; Heat Pumps and Air Handlers. Technical Specifications: 24 Volt General Purpose Relay with Dpdt Switching; 24 Vac Coil Ratings Voltage; DPDT Switching; 50/60 Hz. Replaces Part Numbers: R8222D1014; Amer Furnace 1420-620; 1420-625; BTU 91QC-24-2DT; General Controls(ITT General) R4A121C; R4A021D; R4B121C; R4B021D; R4E121C; R4E021D; R4F121C; R4F021D; General Electric 3AAP1; CR120J10012; CR120J00112; CR120J20012; CR120J00212; CR120J01012; CR120J11012; CR120J02012; Guardian Electric Series 900; Series 1200; Series 1220; Honeywell R8222A,B,C,D,E,F,G,H,J, R8222C1016; R8222C1024; R8222D1048; R8222D1063/V; R8222D1071; R8222D1089; R8222D1113; R8222E1011; R8222F1027; R8222F1050; R8222G1009; R8222H1007; R8222H1015; R8222J1002; R8222J1010; R8222J1028; R8222J1036; R8230F1001; R851G1008; R888A1DS; R888B1DS; R888F1001; Mars 90290; 90293; 90340; Potter & Brumfield AB7AY24; AK7AY24; AK11AY24; AKC11AY24; AB8AY24; AK8AY24; RBM 84-20102-101; 84-20105-101; 84-20103-301; 84-20106-301; 91-102006-11300; 91-102006-13300; 91-112003-11300; 91-132006-13300; 91-102006-12300; 91-122006-11300; 91-122006-12300; 91-112006-13300; 91-122006-13300; Type 184; Type 98000; Robertshaw 690-340; Steveco 90-290; 90-293; 90-340; 90-256; York 024-12955.